“I love Indiana Jones,” says Jackie Chan‘s character, Professor Jack Chan (yes, really), who is “China’s greatest archeologist”. At the behest of an undercover Indian princess (Disha Patani), Jack is recruited to recover the lost treasure of Magadha, believed to be the birthplace of Buddhism and a site of significant historical importance in the development of Chinese-Indian relations. At times, the film’s script sounds more like a public information film, referencing things like the ‘one belt, one road’ policy, as if Jackie Chan fans have much interest in China’s cross-border trade agreements. Even the title suggests a union, of sorts, by amalgamating China and India’s most popular physical exports. The script is clunky, too: when characters say anything remotely prescient or symbolic, there is an almost audible gear-change in the dialogue which immediately makes the scene feel stilted and formal. It also unashamedly steals most if its ideas from Indiana Jones films; from the khaki fashion to the ancient maps, underground temples and booby traps. Being a cross-cultural phenomenon, Jackie Chan is no stranger to this sort of globe-trotting, completely innocuous, nonsensical adventure fluff. It falls neatly into his post-millennial Beijing-led canon, which has almost exclusively been designed by a committee of accountants with vested demographic and commercial interests. Despite reuniting with long-time collaborator Stanley Tong (who directed Chan in another India-themed crossover, The Myth), there is no real sense here of their former glories. But it would be churlish to dismiss the movie as merely a cash-cow, because for the most part it’s light, breezy, colourful entertainment with absolutely no serious peril or consequence whatsoever. It even has the purely wholesome audacity to end on a Bollywood dance number. No one is ever in any serious danger, even when faced with an onslaught of mostly incredulous animal-based action sequences. There’s actually a lot of these; all of them computer generated and completely weird. 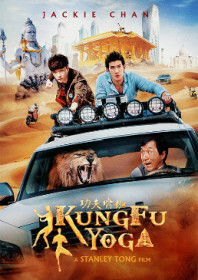 There are sequences involving elephants and snakes, an extended hyena-based routine and a really strange chase through Dubai in which Chan shares a car with a lion. There’s some nice supporting roles: Eric Tsang drops in for a comedic break, and Aarif Rahman is a dashing, athletic presence. But the English-speaking Bollywood stars Sonu Sood and Amyra Dastur are completely wasted with incredibly flimsy, two-dimensional characters. Studio: Shinework Pictures, Taihe Film Investment Co. Ltd.